Since 1991, attorney Julie Johnson has represented thousands of people in the Dallas-Fort Worth area. As a seasoned trial lawyer, she provides highly effective courtroom representation along with unmatched settlement results for her clients. She handles a broad spectrum of legal matters, including cases that involve personal injury, (like car, truck, motorcycle accidents), along with family law (where she handles divorce, child custody, and child support) as well as mediation. If you have been injured in a life changing car crash, suffered a serious fall and injury or have been hurt on the job, the Law Office of Julie Johnson PLLC will take action to obtain maximum possible compensation. It is important to have a lawyer who understands the causal impact of an accident and the issues clients face in dealing with a significant injury and lost time from work in order to maximize damage recovery. Attorney Johnson takes personal injury cases on a contingency fee basis, meaning there is no fee unless your case is successful. Ms. Johnson has obtained many substantial settlements for her clients, and as a result of her work has been awarded with a prestigious membership in Multi-Million Dollar Advocates Forums. The firm also handles a substantial divorce, child custody and family law practice. Going through a divorce is one of the most stressful events in a person's life. It is important to have a lawyer who can aggressively represent the interests of their client but who also brings a common sense approach to resolution in a cost effective way. Julie Johnson has created a variety of flat fee, contested fee, and payment plan options to accommodate the financial needs of her clients. Ms. Johnson also serves as a mediator. Her experience representing both plaintiffs and defendants makes her uniquely suited to facilitate resolution in cases. She mediates the full range of civil and family law matters. Ms. Johnson has received numerous accolades for her legal work. 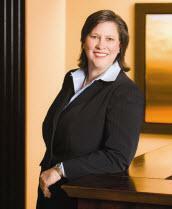 She was named to Super Lawyers and Top 100 Trial Lawyers for the state of Texas. She has received an AV rating* from Martindale-Hubbell and is accredited by the Better Business Bureau. The most meaningful accolades however are the comments and statements of gratitude from her clients. For all of these reasons, the Law Office of Julie Johnson PLLC is simply the best law firm to fight for your legal rights. To schedule a free initial consultation, call the Law Office of Julie Johnson PLLC in Dallas, Texas, at 214-290-8001. Evening and weekend appointments are available by request. * AV Preeminent is a certification mark of Reed Elsevier Properties Inc., used in accordance with the Martindale-Hubbell certification procedures, standards and policies. Martindale-Hubbell is the facilitator of a peer review rating process. Ratings reflect the confidential opinions of members of the Bar and the judiciary. Martindale-Hubbell ratings fall into two categories - legal ability and general ethical standards. AV preeminent reflects the highest possible ranking.